The last two weeks have seen us touring around Victoria, and SoS wasn't possible during that time. I wondered how the garden would look after a fortnight, but all was in order upon our return. Our watering system did its work well, as did a friend who kindly watered pot plants. Six on Saturday is a meme hosted by The Propagator and if you are interested in seeing what other people have in their gardens, drop in on his blog to find out what's been happening in the past week. Horticultural delights await, I can assure you. 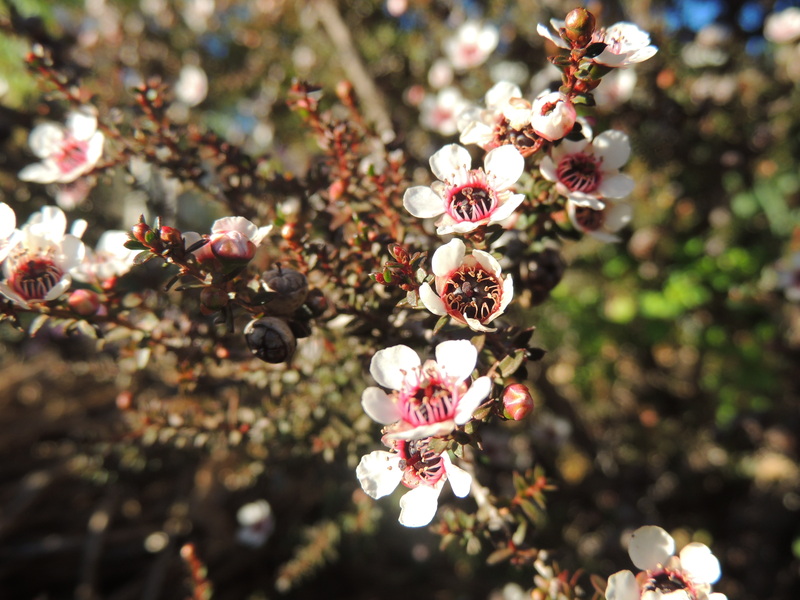 Leptospermum scoparium 'Kea' bloomed in our abscence. It's a dwarf plant that will keep on flowering for weeks and has an abundance of petite white flowers whose stamens look like sea anemone tentacles in miniature. 2. The olives ripened while we were away and now must be picked and pickled. I think they're Manzanilla: they're very large and healthy. 3. Correa pulchella 'Ring-a Ding Ding' (I won't take responsibility for the name), also known as Australian Fuchsia, although they're not related. What a star this plant is: covered with flowers which also last for weeks, tough: drought and frost hardy. 4. 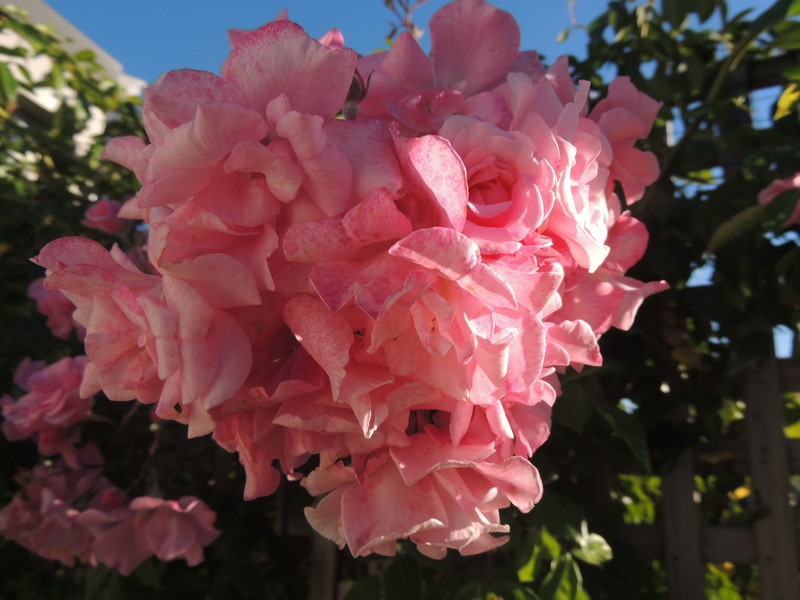 Rosa 'Climbing Pinkie' has been rampageous in her climbing habit, although not in flowering, but I managed to capture a slightly blousy cluster of blooms. 5. 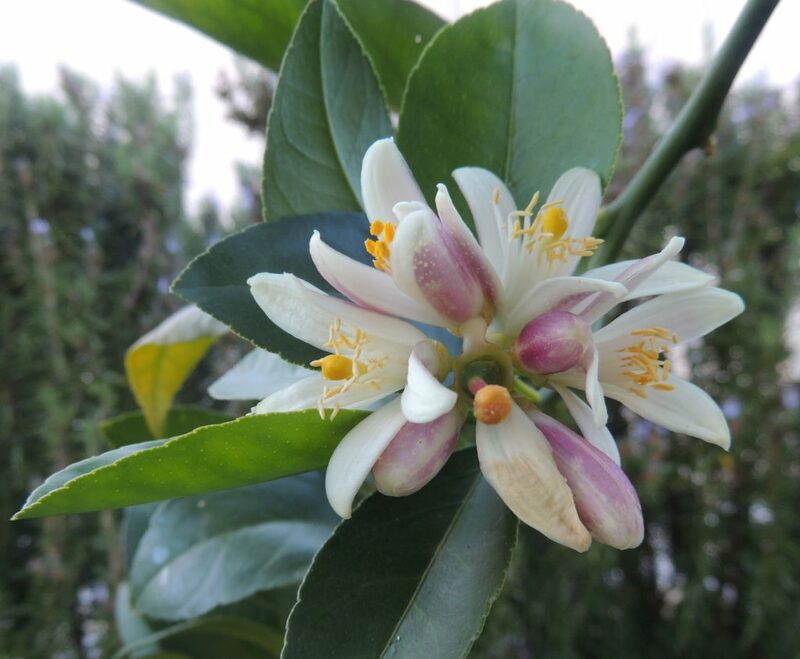 After a very dodgy start that involved much yellowing and dropping of leaves during the summer, my dwarf Meyer lemon has decided to behave itself and is flowering its socks off. 6. My little group of plants purchased from Lambley Gardens. Iris cretensis 'Starkers Pink', Erigeron glaucus 'Seabreeze', Ceratostigma, Erica 'Ruby Shepherd', Sedum 'Postman's Pride', Salvia microphhylla ‘Ribambelle', Salvia 'Celestial Blue', Tulipa 'Queen of Night' and Tulipa 'Menton'. Weather today: Sunny and perfect, 0.4-21 degrees C. Frosts are coming soon! Previous Post Lambley: late Autumn Garden. Love the blowsy rosa and the plump olive! Pleased to hear your garden survived your absence, always a worry when travelling. What a healthy set of six. You are going to be busy with those very plump olives. Thanks Pauline. As the olive tree is still young, it isn’t really laden with olives so I’ll probably only get a couple of jars. It’s a bit different from when we had 500 trees to deal with! I don’t yet have a Meyer lemon tree but seeing posts about this lemon makes me want to have one (another citrus will be added to my “collection”). I also liked your Correa pulchella. Do you know the minimum temperature required in winter? Hi Fred, we have winter temps down to around -2C and the lemon doesn’t like it but tolerates. The Correa doesn’t seem to worry. The days are often quite warm after a frost. I don’t know how either plant would cope with snow or long periods of cold days. Probably not well. What a wonderful selection, Jane! 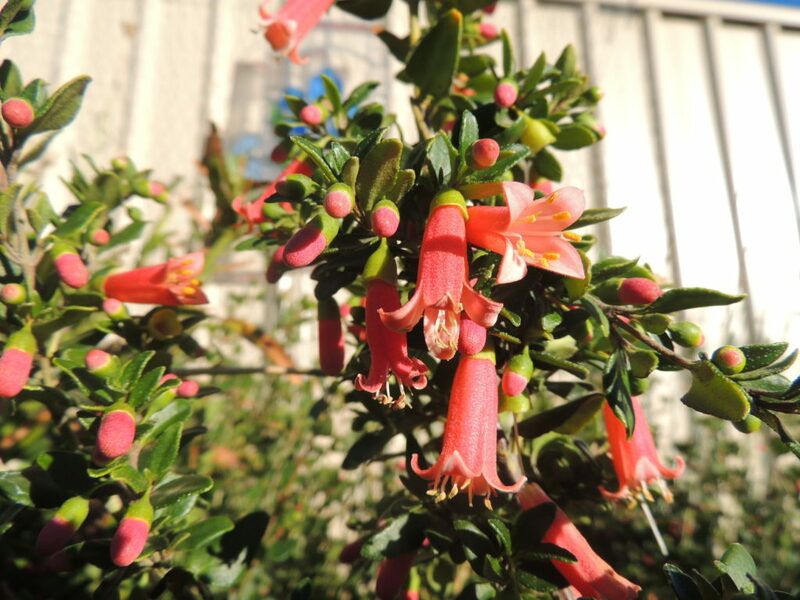 I love the sea anemone flower, and Australian fuchsia is life very too. How fab to have olives! Is it a little big process to brine and pickle them? Thank you Ali. It isn’t hard to do the olives: I soak them in water (changed each day) for two weeks and then put them in brine for 6 weeks. Marinate afterwards with your choice of herbs etc. The Correa is fantastic, and it is interesting to see a garden olive tree. It’s always fun to see gardens with plants that are completely different that those that I can grow. Thanks Nick. I feel the same looking at northern hemisphere gardens! Correa is barely hardy here, there’s one in a garden down the road, I keep thinking I should knock their door and ask for a cutting. Great plant. It seems to survive our frosts, Jim, but I think it would find protracted cold damp weather a challenge. Worth trying a cutting though! Thanks Gill, I’ll be busy planting, but it’s funny how I’m now looking at some of those and wondering where I’ll put them! Lovely to see plants from the other side of the world. And how wonderful to have some newbies to plant. Queen of the Night is a lovely tulip. Hi Jude, I’m really looking forward to seeing how those tulips do here. I like that Aussie fuchsia. Wonder if that would work here. Probably, if it’s hardy. It might, it’s worth a try. Love the descriptive stories here :). Rosa’s rampageous climbing habits; petite sea anemone tentacles; blowsy clusters of blooms – what an eye – a gardener’s delight! Thanks Liz! I’m always trying to think of new ways of describing things. Jane, The Correa pulchella is a plant I’ve seen many times in gardens here but never knew it name, many australians plants grow well here because the climate is quite similar. Wish you a wonderful sunday! Hello Marcelo, thanks for dropping in! Happy Sunday to you too. Fantastic rose. Too bad she is not more generous with her blooms. And I totally have olive envy. I think Climbing Pinkie will be much better in the Spring. We’ve had a long dry spell, so maybe she didn’t like that! I guess you can’t grow olives where you are? Oh, the olives! And such a cheerful group of plants and bulbs waiting to be dug in. And you’re expecting frost soon! How cold does usually it get in winter? We can have frosts down to -2C quite often and sometimes a good bit colder. After a frost the days are nearly always sunny. Beautiful! It’s interesting to see how far behind ours your citrus trees are. All our trees flowered months ago and are now loaded with ripening fruit. Hello Carol, I planted my lemon tree last November and it really struggled through the summer. It’s only just coming right now, and I can see a few little lemons emerging. I think you must be on the coast? Interesting choice this week Jane. 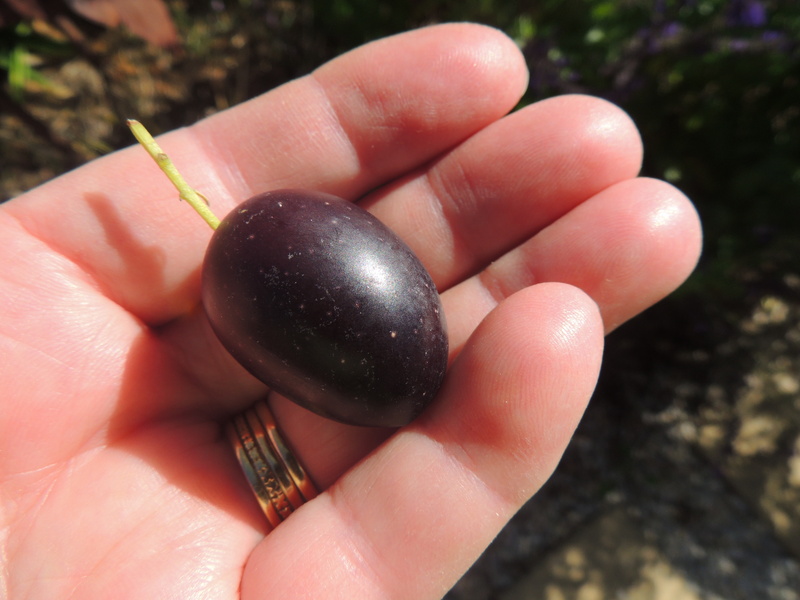 Your olives are really large, much bigger than those we grow for their oil. Glad you had a good trip and that the plants made it home! Thanks Christina. When we had our olive farm, we grew Frantoio and Corregiola trees for oil, and they made delicious EVOO. The olives from those trees were small. 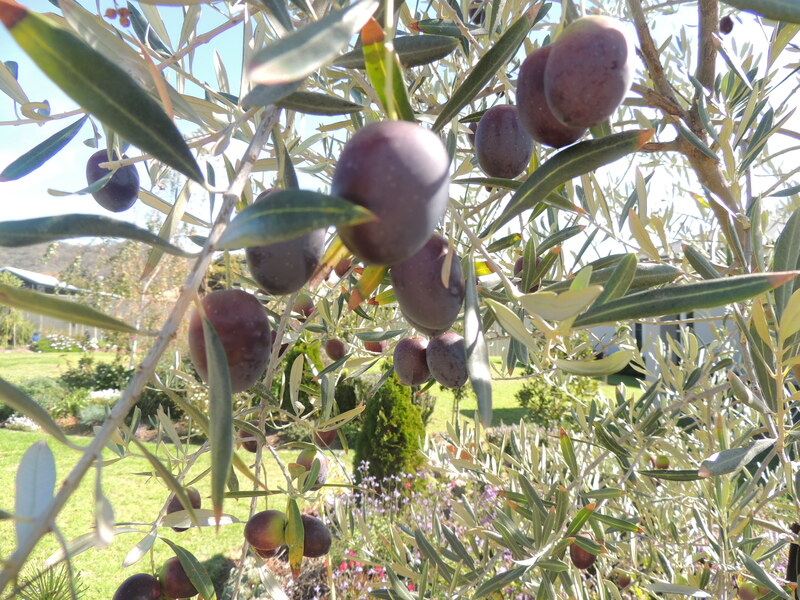 Now I have two trees only and will harvest olives only for pickling. I love your leptospermum, so full of bloom. I can’t seem to keep it. Does it need an acid soil? The correa is so pretty and everyone should have a Meyers Lemon. Fabulous. 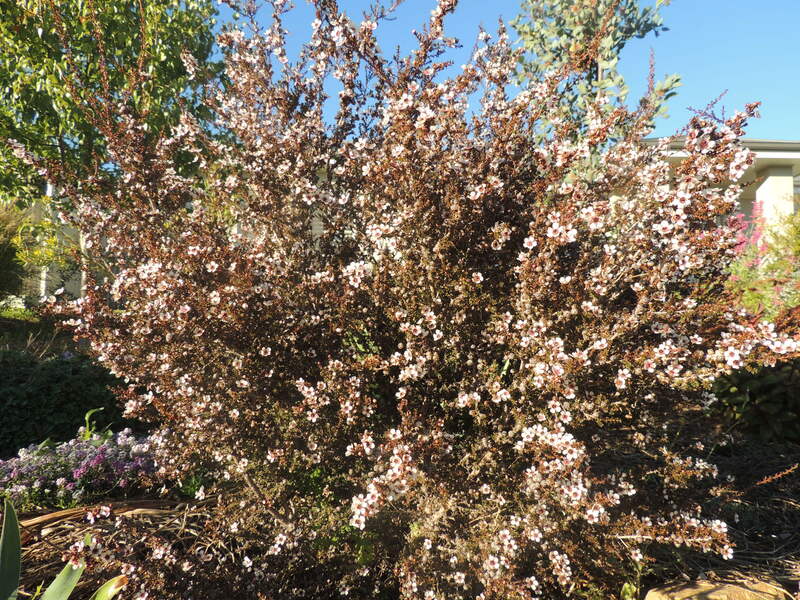 Hello Chloris, I find leptospermum largely uncomplaining and tolerant of any soil, but perhaps the soil has been too wet for yours. You remind me about Leptospermum! What a charming plant. Years ago there was one I passed on my way to work which was huge. I will have to think of someone to convince to plant one now! They come in all sizes-you could just plant a small one that doesn’t take up much room! What a lovely array of flowers and Manzanilla olives (bought from one of our markets) are my favourites, so I’m thinking how lucky you are to have your own bush/tree. Your Correa is flowering very prolifically and a beautiful colour. Hello Vicki, I’m glad you enjoyed the photos. The Correa is indeed full of lovely flowers at the moment. It must really like the spot I put it in as I have another that hasn’t done anything. I’m envious of your olives and citrus! I have to pick those olives soon, Eliza, they’re ready to drop! 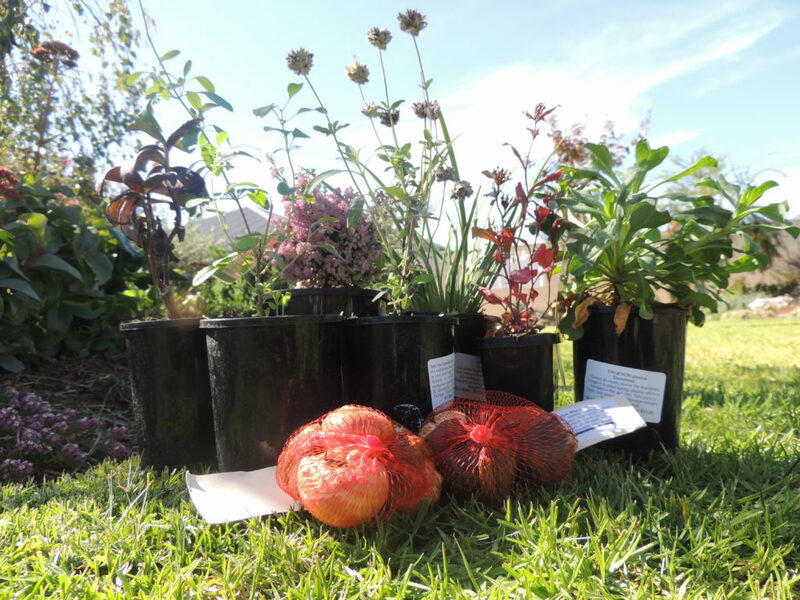 You picked up a nice collection of plants at Lambly! I’ll be interested to see how that Salvia ‘Celestial Blue’ (which may or may not be the same as yours) – it died in short order here, though it was purportedly a hybrid of a California native. The Correa is lovely too. Hi Kris, I don’t usually buy more than one of each plant as I make cuttings, and I’m hoping to do that with the salvia celestial blue. I hope it doesn’t die before I get a chance! I see you already have many comments and praise of your olives. They truely are wonderful and so interesting to see growing! I’ve picked them now. I had to as the parrots were coming and eating them!